ATACS 4103: CLEAR EPOXY/AERODYNAMIC SMOOTHER (BMS 5-123F, TY 1, CL 1) « Atacs Products Inc.
ATACS 4103 unfilled, clear, aerodynamic smoother features an ultra-fast cure epoxy adhesive with excellent adhesion to aluminum, steel,copper,ceramic,plastics and various other substrates. This resilient adhesive and insulating compound has exceptional freon and moisture resistance, as well as resistance to environmental degradation. 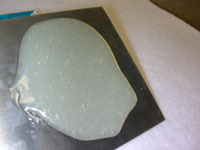 Rapid cure in thin sections at room temperature of 50°F and above to yield tough, high impact, clear resin. Non-fuming, relatively non-irritating hardener. Low viscosity. Convenient mixing ratios. Good Class A(105°C)electrical properties. Very short gel time. Meet Boeing Specification BMS 5-123F, Type.I, Class.I . Combine Part A and Part B in the correct ratio and mix thoroughly until the color and consistency are uniform. Mixing the adhesive just prior to use is recommended. Heat buildup during or after mixing is normal. Do not mix quantities more than a pound as dangerous heat buildup can occuur causing uncontrolled decomposition of the mixed adhesive. Mixing smaller quantities will minimize the heat buildup.